While we show our appreciation year-round, each September we set aside one special week to put the spotlight on our Housekeeping heroes and say thank you for offering a positive stay. From September 9-15, it’s time to bring this valuable back-of-house team to the forefront. Below, we’ve included everything you need to know to make this your best Housekeeping Week ever. Share Your Housekeeping Week Photos and Win! 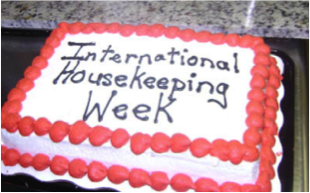 International Housekeeping Week is a great way to boost Team Member morale, positively impact SALT scores, reinforce brand standards and values, and have a lot of fun in the process. We’re not the only ones who think so—hotels across Hilton are just as excited. 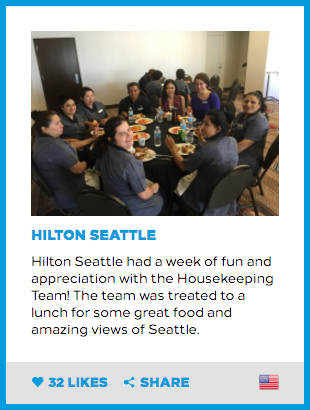 We want to recognize every Housekeeping team across Hilton! That’s why we created the Housekeeping Wall of Fame. You can submit a photo of your team along with a “shout out.” Let us know what makes your team so special or what you plan on doing during the week. Approved submissions will be displayed on the Housekeeping website. The deadline for entering is September 28. All entrants will be eligible to win one of 25 gift cards worth USD $100 each, to be used to throw a team party. Details below. In addition to the global Wall-of-Fame, you can create your own hotel-specific scrapbook (see inset). Add photos of your team along with congratulatory messages. Add as many photos as you want! You can download a scrapbook specific to your location at any time. Print and display the scrapbook for all to see, and present to your Housekeeping team as a memento at the end of the week. By adding photos, you’ll be eligible to win one of 25 gift cards worth USD $100 each, to be used to throw a team party. Details below. Click here to start building your scrapbook. Win a Housekeeping Team party worth USD $100. 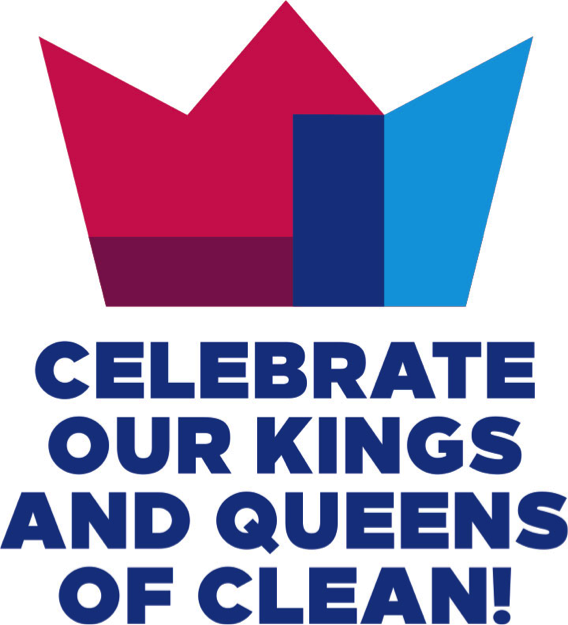 This year, the Recognition Team will select 25 winning Housekeeping teams from across Hilton. Winning locations will receive a USD $100 gift card to subsidize a team party. To be eligible, all you have to do is submit a photo to the global Wall of Fame or your hotel-specific scrapbook. You can also share your photos on social media using the tag #IHW18. The deadline for entering is September 28. Winners will be selected at random from both the Wall of Fame and social media. Look for winners to be announced in the October issue of the “Recognition Matters!” newsletter and on the Prizes & Winners page. So what are you waiting for? Add a photo today. Give your celebration a boost with these customizable materials. Click here to download the items below. All content is customizable, including language. NEW! Photobooth Props. Trim, put together, and have your team pose for photos as a memento. Some assembly required. Recognition Certificates and Thank You Cards. Use these to say thank you and to acknowledge service, attendance, cleanliness scores, attitude, teamwork, and more. Team Area Promotional Flyers. Print and post in team areas to build awareness and excitement. Customizable Water Bottle Labels and Candy/Protein Bar Wrappers. Turn a simple water bottle or candy / protein bar into a high-impact recognition tool. Team Area Pennants. Use these colorful branded pennants to decorate your team area. Affix to the walls or string together. Team Photo Frames. Add a photo, print, and post around the hotel to highlight your team. You can also print and frame them, and hand them out as mementoes. Housekeeping Fun Facts Worksheet. Use this simple worksheet to calculate the number of beds made, rooms cleaned, and other interesting facts. Then, print the results and present them to your team in recognition of their hard work. Desktop Wallpaper. Download an International Housekeeping Week wallpaper for your desktop background. Hotel Scrapbook. 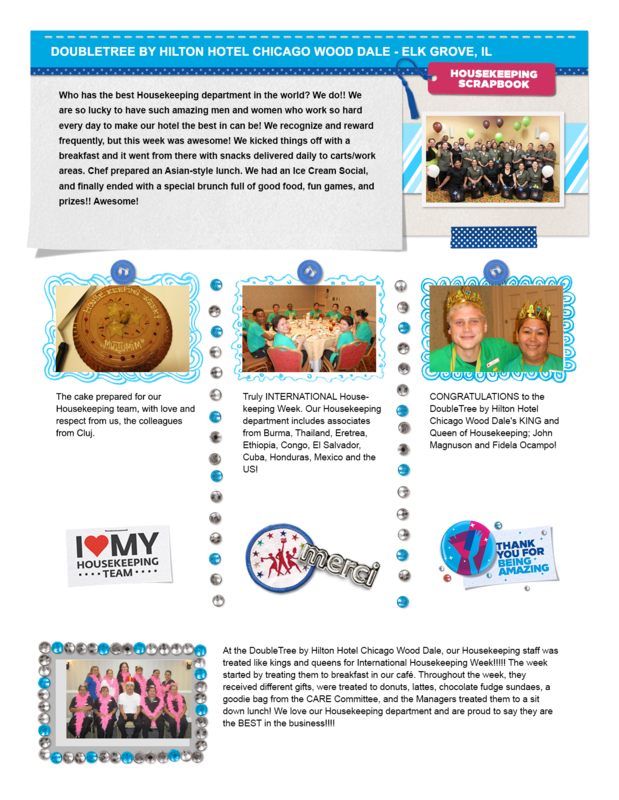 Create an online scrapbook specific to your hotel and share with your team. We compiled a list of our favorite International Housekeeping Week best practices, submitted by hotels from across Hilton. From low-cost party and gift ideas to skill-building contests and SALT incentives, these ideas are designed to boost morale, drive performance, reinforce brand standards, and have fun! To view all 101 best practices click here. Sunday, September 9 is Teddy Bear Day. Challenge Team Members to a towel origami contest! See who can fold the most creative towel creatures. Monday, September 10 is Swap Ideas Day. Call up a sister hotel in your area and swap best practices. Then, swap a friendly card signed by all of your Housekeepers! It's also Boss / Team Member Exchange Day. Jump in and help your Housekeeping team while they relax. Tuesday, September 11 is Make Your Bed Day. Give your Housekeepers a break and help with making beds. And it’s the perfect day to have a bed-making contest. It’s also Grandparent’s Day. Take the time to recognize the grandparents on your team! Wednesday, September 12 is Chocolate Milkshake Day. It’s also Boss/Employee Exchange Day. Have some milk shakes of all flavors ready at your morning huddle. Then take the time to pitch in and help your Housekeeping team. Thursday, September 13 is Fortune Cookie Day. Hand out fortune cookies during the day and share the fun. It’s also National Peanut Day. Bake some peanut butter cookies (and have someone else make sugar cookies for those with nut allergies) for your hard-working Housekeeping Team Members. Friday, September 14 is National Cream Filled Donut Day. Whether you enjoy chocolate, vanilla, lemon, or ganache filling in your donut, today is the perfect day to enjoy these sweet treats! It’s also Eat a Hoagie Day. Need we say more? Saturday, September 15 is Make a Hat Day. Buy inexpensive hats at a party store. Get your Housekeeping team to decorate them (or have other teams decorate for them) and wear them for the day. Hold a Medal Ceremony. In conjunction with the summer games, recognize your Housekeeping Team Members at the end of the week with a gold medal and a note of appreciation.